Craft Year was a special project led by the CCF/FCMA in partnership with all of the Provincial and Territorial Crafts Councils across the nation. 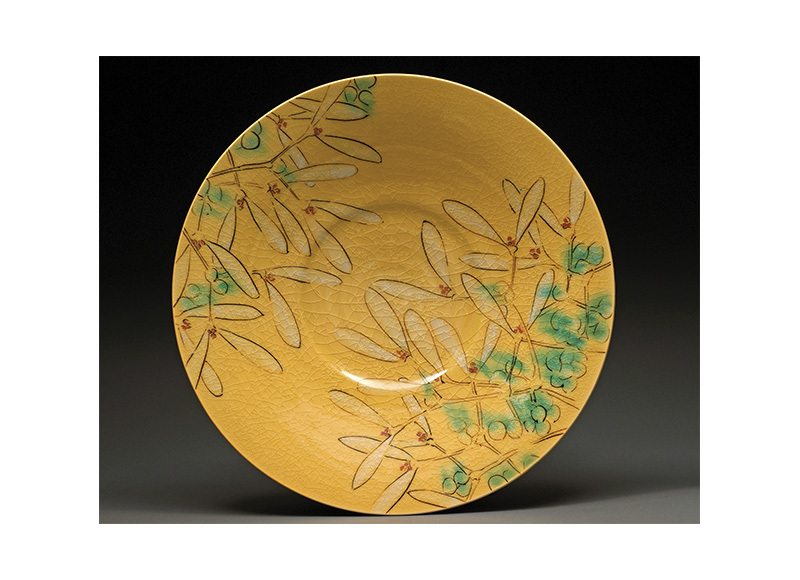 A year long festival of contemporary fine craft, Both Craft Years (in 2015 and 2007) included event listings from all over the country. It was a platform to promote Canadian craft activity at the local, regional, national and international levels. Events and activities included in the listings were exhibitions, festivals, fairs, studio tours, fundraisers, book launches, publications, seminars, conferences, symposiums, educational programming, family events and many more. In the first installation of Craft Year in 2007, the estimated number of events ranged from 50-100 across the country all throughout the year. By years end, 712 events had been registered in the festival, deeming Craft Year 2007 an international blockbuster hit. The second installment of this national celebration, Craft Year 2015 reached 884 events – an increase of 19.5%. Find out more about what events took place and where, as well as the online Craft Year experience, in our Craft Year 2015 infographic here. 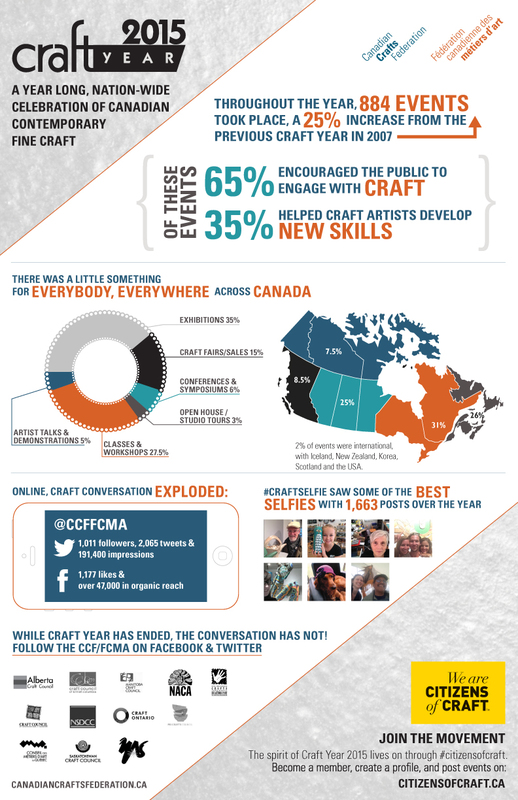 Each year since 2001, the CCF/FCMA has hosted an annual national gathering, drawing craft professionals from organizations and associations together to discuss issues of national interest and importance. Events have taken place in Ottawa (2001 & 2012), Montreal (2007), Toronto (2008), Fredericton (2009), Winnipeg (2010), Iqaluit (2011), Vancouver (2013), Charlottetown (2014), Quebec City (2015), Calgary (2016), and Burlington (2017). Next up: we head to Nova Scotia. For more information see here. Canada was the official guest country of the 2009 Cheongju International Craft Biennale, the largest fine craft based event in the world. The CCF/FCMA organized and executed Canadian programming throughout the 40 day event, including an exhibition of 206 pieces by 212 Canadian craft artists (titled: Unity & Diversity), a Canadian Marketplace of retail-oriented craft objects, and a series of educational and cultural activities relating to Canadian craft activity including lectures, demonstrations, workshops and performances by Canadian craftspeople and academics. In the lead up to the 2009 exhibition, the CCF/FCMA worked with the Alberta Craft Council and the Craft Council of British Columbia to exhibit a preview exhibition at the 2007 Cheonju Biennale, welcomed leaders from the Biennale staff on a cross-Canada arts exploration tour. Following the 2009 events, we also hosted the ‘Art of Craft’ exhibition, containing three contemporary fine craft shows at the Museum of Vancouver during the 2010 Winter Olympics, including a condensed exhibit of ‘Unity & Diversity’, a BC & Yukon exhibit titled ‘By Hand’ and a Korean exhibition titled ‘Moments in Between’. Over 10,000 visitors attended these exhibitions. 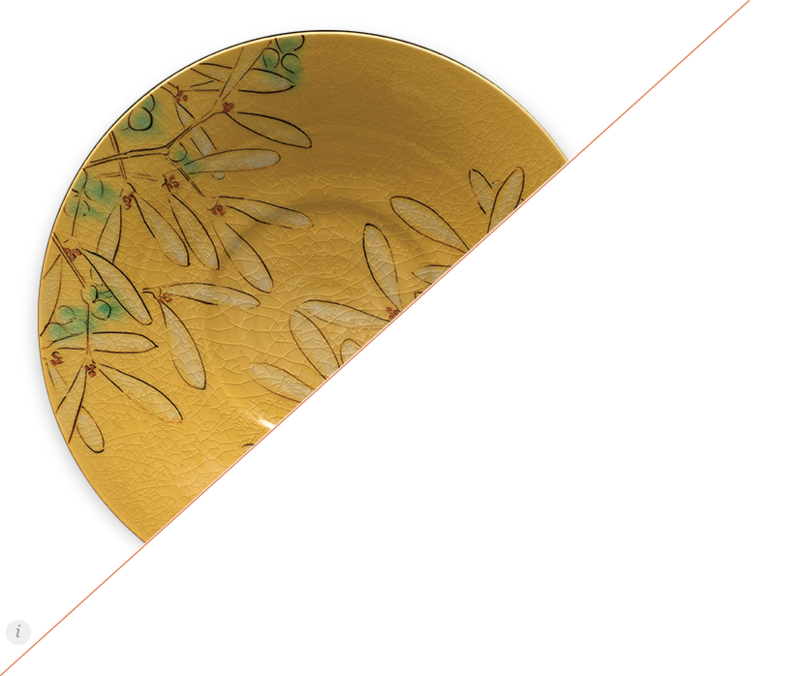 In 2013, CCF/FCMA Director, Maegen Black, was invited to return to the 2013 Cheongju International Craft Biennale to present a lecture about Canadian contemporary fine craft. Canadians have continually been featured in the Biennale since the original CCF/FCMA collaborations began in 2007.